In medieval Europe, “miracle plays” were acted out by clergy as a way of teaching Bible stories to the illiterate masses. Eventually, those same masses began performing the plays themselves. But the storylines, characters and details of these folk dramas changed and became cheekier and racier over time. The Church banned these plays in the 15th Century. In Spain, such plays were called autos del Nacimiento, and despite the ban, they were pressed into service again in the 16th Century to teach Bible stories to the illiterate natives of the New World. What was probably a relatively unadulterated version of Los Pastores (from the Church’s point of view) was used by Spanish missionaries in Mexico to relate the story of the Nativity. Again, Los Pastores – sometimes called La Pastorela – was adopted by the public, and performances were moved to the town square. And again, the storylines, characters, and details of these folk dramas changed and gradually became more comical and entertaining. What had been a straightforward story of shepherds traveling to Bethlehem became a comedy. It was sort of the “Rosencrantz and Guildenstern Are Dead” version of the Nativity. Although many versions exist, Los Pastores generally involves lazy, dim-witted, bumbling shepherds who can barely be talked into getting off their butts to go see the new Savior. As they travel, they are alternately protected by angels and tempted by the Devil and his minions with various distractions. An irascible hermit encountered along the way helps the shepherds stay the course. The story ends with the shepherds delivering gifts at the manger and the Devil admitting defeat. Los Pastores was first brought to Alta California by the Franciscan missionaries. One version of the play was written in 1803 by Fr. Florencio Ibanez of Mission Nuestra Señora de la Soledad. Some have cited this as the first play written and performed in our state. And it certainly made its way to our own mission town of San Juan Capistrano. At a 1922 meeting of the Orange County Historical Society, member Bessie Carrillo shared José Juan Olivares’ stories of 1850s Capistrano, including a mention of the Los Pastores players visiting "some of the houses," where they "always found a good dinner prepared for them." 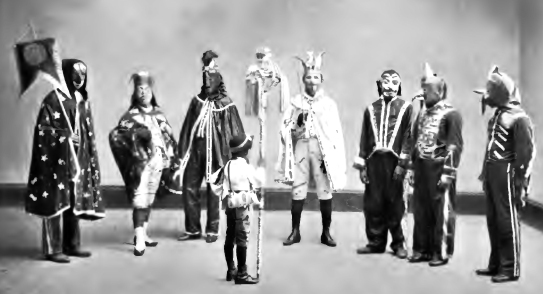 A number of communities in Orange County still performed Los Pastores in the 1920s and 1930s. Many who had fled the Mexican Revolution (1910-1920) came to California, bringing their traditions with them. The biggest and perhaps most popular local Los Pastores production was put on by the residents of the Santa Fe barrio in Placentia. But the play was performed by various groups in many local communities, including Anaheim, Buena Park, La Habra, El Modena, Delhi, and Placentia’s La Jolla barrio. Shepherds urging Bartolo to rise. San Antonio, Texas, 1893. Photo courtesy American Folklore Society. In a 2008 Orange County Register article and again in a 2013 article for Somos Primos, O.C. Superior Court Judge Frederick Aguirre recalled the involvement of his grandfather, Jose Aguirre, who led the annual rehearsals and performances in Placentia from 1920 until his death in 1934. 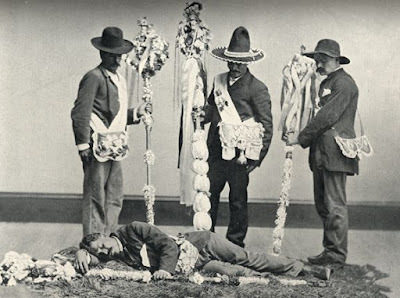 The Aguirres had already performed in the play for decades in Michoacán, Mexico before coming to the United States in 1918. “Bedecked in colorful gowns, grotesque, brightly painted, hand-carved wooden masks, swords and staffs, the entourage would perform at a predetermined home,” said Judge Aguirre. Each performance lasted about two hours. Aguirre also outlined the first portion of the Placentia version of the play, beginning with a chorus singing about the joyous arrival of the Savior. The hymn’s lyrics are fairly universal except for the last bit in which tamales are offered to the Holy Family. Tebano, one of the shepherds, enters and proclaims that an Angel appeared to him, announcing the birth of Christ, and telling them all to travel to Bethlehem. The rest of the story unfolded from there. 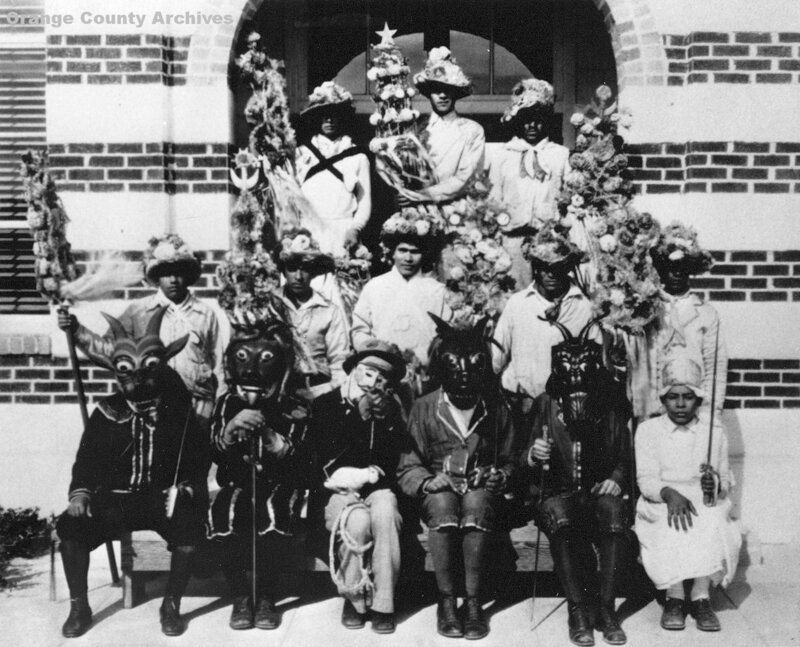 For the 1928-1929 holiday season, two performances of the play were given by a group from Delhi under the direction of adult education teacher Mrs. Jessie Hayden. The group performed one night at the Logan barrio night school and another at the Fairyland Dance Hall, 2701 S. Main St., in Delhi. Devils with shepherd boy. San Antonio, Texas, 1893. Photo courtesy American Folklore Society. In their coverage of the 1931 Delhi production, the Register noted that at least 20 different versions of the play were performed in various parts of Mexico at the time, and that the version director Pablo Lopez had selected came from Zacatecas. It was called “The Coming of the Messiah,” and it included roles for more players than most versions, but it sounds like the storyline was a bit of a train wreck. “The next scene shows the shepherds awakening in the cold dawn, calling to one another, joking, complaining of the climate and the scarcity of food. The all pray that God will bless their labors and increase their flocks. Then the shepherdesses go to care for their hens and doves and the shepherds depart. Both the 1929 and 1931 Delhi productions were held in January rather than the usual pre-Christmas timeframe. More interestingly, it seems that these particular productions involved, or may have been instigated by, those teaching English and “Americanization” to new immigrants from Mexico. Once again, it was being used as a teaching tool. In a faint echo of the 15th Century, clergy once again tried and failed to reign in the popular folk tradition.